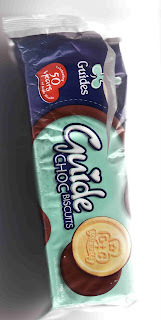 Go out and buy a packet or two of Girlguide biscuits. Ordinarily I wouldn't bother but as the sourpuss, Sue Kedgley is sticking her nose in, calling for a reduced sugar recipe after a Nelson college banned them, I couldn't resist. And I bought the chocolate coated ones. Get a life Sue. Numbers on the unemployment benefit were at an all-time low, but an ageing population had caused a rise in the number on sickness and invalids benefits, he said. This paper reports on research that uses the Ministry of Social Development’s benefit administration data to advance our understanding of the growth in the number of people receiving the Invalid’s Benefit over the decade to 2002. It investigates the growth in inflows of people to Invalid’s Benefit, as this was the main cause of growth in recipient numbers. Some of the growth in inflows can be explained by population growth, population ageing, and the effects of the rise in the age of eligibility for New Zealand Superannuation. However, more than half cannot be accounted for by these factors and is explained instead by an increase in the proportion of people aged 15–59 taking up Invalid’s Benefit. This increase was explained both by growth in transfers from other benefits, and by growth in entries from outside the benefit system, some of which was associated with growth in uptake by former benefit recipients returning after a period off benefit. What really hacks me off is there isn't a political party holding him to account. Tomorrow I am joining NewstalkZB's Face Off panel. 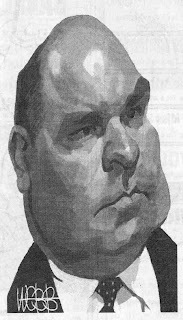 Diversity of opinion about the issues of the week is sought - and the delivery of a brickbat and/or bouquet is invited. It should be fun and will make a nice change from talking about welfare. The Wellington frequency is 1035am and the programme follows the 11am news. The other guests are NZ First MP Ron Mark and Police Association boss, Greg O'Connor. 11. SUE BRADFORD to the Minister of Police: Is it police policy to arrest and prosecute people for every technical offence committed, for example, when parents keep their children out of school to take them on a family holiday? What kind of a mickey mouse question is this? She's looking for a negative answer in order to prove that when smacking becomes a 'technical offence' the police will not, as a matter of policy, arrest and prosecute people for it. It seems to me that smoking dope is a technical offence that the police have long been turning a blind eye to. Yet the Greens would argue that as a reason for decriminalising dope. See the muddle-headed hypocrisy? Oh, what the hell. Let's just have oodles of de facto laws that mean diddly squat. 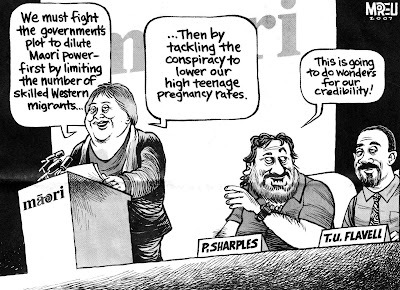 Judith Collins: Why is it that despite all the so-called innovative employment programmes that have been funded over the past year to deal with the sickness benefit and invalids benefit numbers, sickness benefit numbers have risen by another 2,000 to yet another record high, at a time when the Minister of Health keeps telling us that we are a much healthier country these days? Madam SPEAKER: The member will please be seated. The level of interjections is getting to the point where speakers cannot be heard. Members ask questions, and they expect to be able to get those questions addressed. But if answers cannot be heard through the interjections, it makes a nonsense of the whole exercise. I ask members to please control themselves, and the Minister to continue. Hon DAVID BENSON-POPE: To provide some perspective for the benefit of members opposite, who understandably do not want to hear these figures, I say that between 2000 and 2005 the United Kingdom had a net reduction of 6.4 percent in the number of people in receipt of an unemployment benefit or some form of incapacity benefit. Australia, comparatively, achieved a 0.8 percent reduction in those benefits, and in New Zealand over the same period our achievement was a 25.8 percent reduction. Judith Collins: I raise a point of order, Madam Speaker. I listened to every word the Minister said, but at no stage did I hear him address the issue of how it is that sickness benefit numbers keep going up to record high after record high. Madam SPEAKER: I heard the member address the question—at length. And they move onto the question 9. The comment came as he attended the launch of a public-health awareness campaign in Abu Dhabi. Touring the city's Imperial College London Diabetes Centre with the Duchess of Cornwall, he asked nutritionist Nadine Tayara: "Have you got anywhere with McDonald's, have you tried getting it banned? That's the key." He didn't much care for the ban on fox-hunting, swearing to leave Britain forever. But it's OK to stop his common royal subjects from enjoying a Big Mac. He said: "It's more virtual than real and in reality it does virtually nothing." We want to see allocation made to address the income issues of the working poor; and to assist our most vulnerable citizens, benefit dependent families who are not accessing Working for Families. We would be interested in receiving a cost analysis of what benefits could be expected from removing tax on employment, DPB, sickness and invalids benefits. Does anybody else see the incongruity of one moment slamming welfare dependency and the next suggesting rates could be higher? Help me out on this if you can. I've been told tax on social security benefits was introduced in the eighties and was intended to ensure one standard of citizenship. Everybody was to pay tax. Is this correct? Beveridge didn't bargain for the "entitlement mentality"
Beveridge (architect of Britain's welfare state) never meant welfare to be free of conditions. Nor did he think it important to give incentives to claimants to leave welfare. He assumed people would do that automatically as jobs became available. Why is it now the government's job to incentivise beneficiaries into work? At a recent meeting a woman asked what ACT would be doing about making it worth her while. Look at what she is really saying. There is work for her but because it only pays a bit more or the same as her benefit she doesn't want to do it or think she should. Mind you, she doesn't object to you working so she doesn't have to. Dr Cullen said yesterday that Mr Key could afford to donate to charity because "he's got a lot to give". He was surprised Mr Key bothered claiming the $630 rebate. So John Key claims the maximum rebate on his charitable donations. So what? It's $630 Cullen can't waste and Key can give to whom he pleases. Michael Cullen epitomises Labour's enviest ethos, their cringe-making mean-mindedness, their graceless, grudging attitude to material success. If the environmentalists didn't own the colour, green would better suit Labour. This is a good overview of the effects of the US welfare reforms. They are mixed. Although millions fewer families rely on cash payments, other government aid - food stamps, medicaid and disability payments - continue to grow. Anti-reformers complain about ex welfare recipients being in low paid jobs and needing to supplement their income with non-cash forms of aid. They still want the government to provide education instead of jobs. My feeling about that is it is up to the individual to get things in the right order and ultimately, somebody has to do the unskilled jobs. I wish they paid more, but part of the reason they don't is the taxation going into government assistance programmes! But if you want to instill a work ethic in the next generation it has to start somewhere. There is something out of this article which is good news for NZ. Because we don't have as much non-cash assistance and our low paying jobs are on par or better than benefits, the potential for people to become self-sufficient, one aim of welfare reform, is greater. Although with Working for Families we are going in the wrong direction for self-sufficiency. An article from today's NZ Herald describes footage that will be shown at the National Film Archive centre tonight. The event showcases the use of film for political propaganda during the term of the first Labour Government. Other footage from the same era includes a 1936 speech from Savage when he first came to power, his popular funeral parades through Auckland and Wellington in 1940, and the torching of the social security building in 1939 by those opposing the welfare state. "We have home movies of the fire and of the rebuilding, which was apparently done in record time, including various Cabinet ministers pitching in with wheelbarrows to get it rebuilt," Mr Stark said. "It was one of those great unsolved mysteries of politically violent acts." 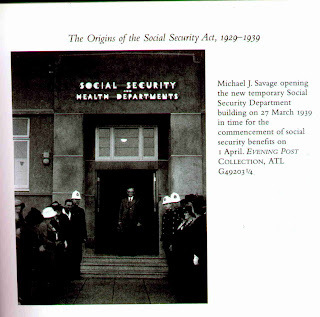 I was aware when Social Security benefits were launched a temporary building was used but that is the first I have read about an act of arson by opposers of the welfare state. I'm certain it wasn't mentioned in Margaret McClure's history of the welfare state. Not all New Zealanders enthusiastically embraced Michael Joseph Savage's welfare state. To be fair, coming from a Labour background, had I been around at the time, I probably would have welcomed it. Seventy years on I believe it's become a disaster. It's no longer in keeping with the times and rather than primarily responding to need, creates it. But I will continue to peacefully oppose it. Besides, in 1939 there was only one building. Today the Ministry has over 200 sites. I saw Connor McCreaddie on TV3 News this evening. He was jumping on a trampoline. Looking half pleased with his world. Only two months ago I suggested it wouldn't be long before the UK authorities moved from fat dogs to fat kids. Sue Bradford is jumping up and down about a new internet gaming site, Race-O, backed by Sir Patrick Hogan and Dave O'Sullivan. She wants the government to shut it down immediately. I didn't know about it until Sue had a tanty. Free publicity for the competition to the TAB. The investors will be pleased. DomPost journalist, Tracy Watkin has written a fair piece on where ACT is at. The transformation of Rodney's physical and psychological approach to MMP politics is covered and she points out the obvious, that with National's move to the centre, an opportunity reopens for ACT but says "voters need a reason to switch back." The problem with that is it paints ACT as usual, as right, of National. Economically, correct. Socially? I hope not. With a classical liberal position consistently presented and properly understood ACT could pull voters from the left as well. Where I wholeheartedly agree with Watkins is in her closing sentences. "He (Rodney Hide) has, in effect, given himself the licence to start with a blank canvas. But the longer he waits to fill in the canvas with some brush strokes , the longer it will take for voters to get the picture." I wanted to make something clear. As someone who has very occasionally smacked her children, my motivation in opposing Bradford's bill is not to retain that right. It's just not that important to me. The protestations of the Christian right, who do appear primarily motivated in this way, don't sit easy with me. My problem is twofold; making smacking illegal is bad law. Law conceived by someone saying, don't worry, it won't be routinely or consistently policed. You say, "The passing of the anti-smacking bill through its second reading at Parliament was a welcome step towards dealing with child abuse." I disagree. This bill is covering up a gross failure to tackle the causes of child abuse. Government agencies were acknowledging child abuse as early as 1967. Child Welfare conducted a survey of the 210 confirmed cases that year. They found was a strong association between illegitimacy and child abuse. Maori children were 6 times more likely to be victims. Forty years on and policy makers are still refusing to face this reality, wringing their hands over unpartnered, teenage birth and claiming more support is the answer. The focus of that support has largely been financial thereby inadvertently exacerbating the problem. Pay girls to have and keep babies and they will, whether or not they are emotionally capable of parenting them and others that inevitably follow. The teenage birth rate has risen for four consecutive years. The Maori rate is more than four times higher than NZ European. Rather than fiddling with section 59 we should be stopping welfare to teenagers, blitzing contraception use and encouraging adoption. Do we have any politicians brave enough to act on these ideas? A small percentage (1%-3%) of people are born to be bludgers. But consider this. Half of the children born in 1994, approximately 30,000, had contact with the benefit system before age three. Having contact with the benefit system means being with an adult care-giver receiving an income-tested benefit. Children may not be born onto a benefit but find themselves on one within a couple of years. Relationships split, fathers become unemployed, they are adopted out to a beneficiary caregiver, a parent becomes sick, etc. For many it is only a transitory experience. But for others it lasts for years and leads to expectations or assumptions that they too avail themselves of lifestyle-welfare payments. "Bivariate analysis of factors associated with long benefit durations highlights having first contact with the benefit system at birth; living with a sole caregiver at first contact; and first appearing with a primary beneficiary who was female, Maori or aged under 20." If the same analysis had been conducted of children born in 2000 the proportion having contact with the benefit system by age 3 is likely to have dropped due to unemployment dropping. But the same underlying factors leading to long stays on welfare would be unchanged. Right now there are 219,000 children on a main benefit - about 20 percent of all 0-18 year-olds. As the concentration is greater in younger ages the incidence rises to one in four. Move into the lowest decile areas and you are probably looking at schools where half of the children are on welfare. Add to this a NZ (AUT) study estimated the true correlation coefficient between welfare participation and their parents is somewhere between one-third and two-thirds, but probably much closer to the lower limit in this range. 1 - 3 percent looks too low to me.